This is a printout of the ad revenue for 'Hot Chicks the card game' for Android devices. This is a copy of the May information only, and in all honesty the previous 6 months are very similar. 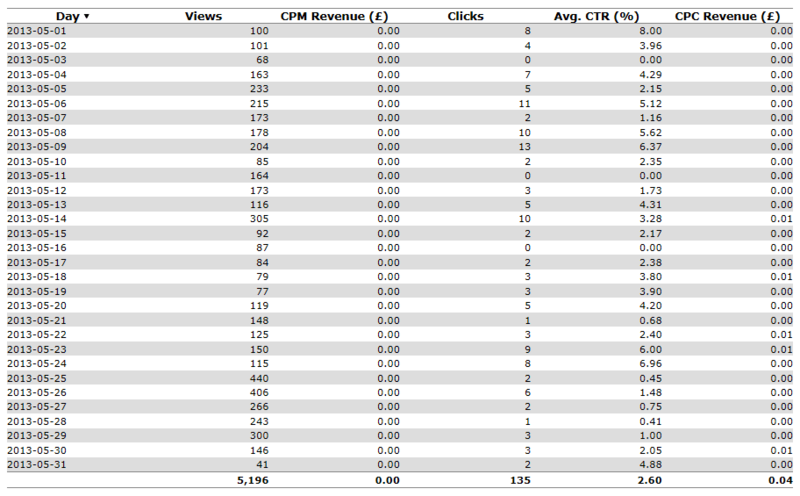 Yes, it varies by some CTR and some pennies earned each month, but it is close. I will have to mention here that I did start with 4 advert suppliers, but they ditched my account as they considered it to be riske. It was very disappointing as I was making a lot more money when I had the other advert suppliers. Due to confidentiality I cannot say which Ad supplier I have this information from. I can say they are my only advert supplier now for Hot Chicks. Earned as much as 11 cents in a month and as low as a single cent. The number of views has varied from 4,500 to 8,200 in a month. The CTR has varied from 1.56 to 6.23. 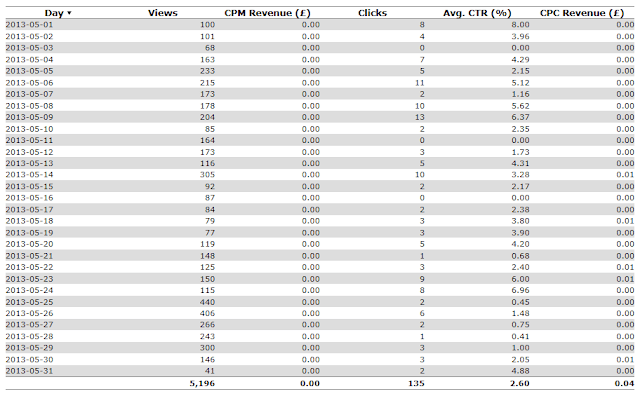 The number of clicks has varied a lot from 24 to 267. This will never make me rich. 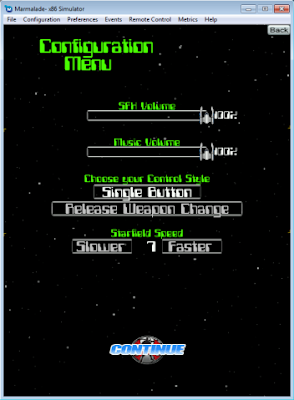 Here is the Shop screen I am implementing for Space Invaliens. There a number of things I want to mention about this screen. I have two currencies. The Gems and the Salvage. 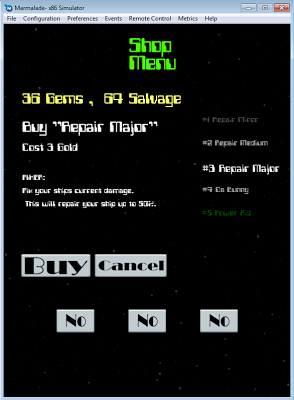 The Gems will be required in all transactions, however the Salvage that you collect will only be used in upgrading the ship, like a stolen technology being used. I also have 3 categories of packages to buy. Fixers, Upgrades and Enhancements. Fixers are cheap packages that allow you to mostly repair your ship on the go, as the Shop screen can be accessed by the in game Pause menu, it is possible to keep repairing your ship on the fly.. till you run out of gems that is. Upgrade are what you are really saving all your gems for. This is where you can upgrade you ship to have more shielding and more firepower. From new firepowers to upgraded ones, it is up to you what you want to buy to help you suit up your ship to devastate the aliens. Enhancements are the Bling of the packages. They are cosmetic in nature, though a few are also able to enhance your scoring ability. Purely the optional buy, though I am sure people will enjoy some of these. The NO NO NO buttons along the bottom are the quick buttons to help you get to the type quicker in the listing carousel. Though at the moment they are in sore need of a set of graphics haha! The items in the carousel and the Buy buttons change color depending on what you can afford or whether or not you already own it (if it is a single buy package, which all but the Fixers are). Above you can see why I tend to work on my designs on paper rather than in word, or onenote or some such. This has a basic layout and some draft ideas for alien movements. Drawing this kind of thing really helps me visualize what I want. I already have the 1st and 3rd of these aliens written. This is the top page of a stack of about 12 pages with writing or drawings all over them. This is also a simple game. In Space invaliens I have spent way too much time on the starfield as mentioned before. However a good side to that story is that I have now incorporated it into my configuration screen. As you can see the bottom option is allowing the player to alter the speed of the starfield. Later I may allow setting for different things, like, Frenetic, Surprise me, and atmosphere etc. Still right now I can have testers tell me what the value should default to. then I can set the average up as the default. On this menu which is currently finished you can see all the basic options most games have. As I intend to put music in this game (I have some excellent music for it) I have decided to put in volume controls. I always tend to fiddle with the balance between SFX and Music when I play games, preferring the music to take a back seat. Along with that we have the actual control configuration itself. allowing a main type to change and then a dynamic sub type under it. This gives me all the controls I need at the moment, but I have not yet included PC specific controls etc. this is for the Tablet control interface. That starfield in the background gives you a direct representation of speed as you alter it in this configuration. If you happen to have come to this config screen from inside the games Pause, then you will be overlaying the game screen, and you will what changes some of your choices make. Such as toggling between a left or right handed players buttons configuration. My two book apps '5GC' and 'ADATZ' have not been doing too well since I released them. Not that I think they are bad, only discoverability wise they are failing. No surprise there eh! Well I have been paying attention to what has had an impact on other games. This has led me to creating a Free weekend on the iOS versions (not tried discounting Android versions yet, if that's possible). Here is the graph of the incident (It was free over both weekend days, 18th and 19th). I had a single sale of these book apps over the last month. As you can see leading up to the weekend I also had no sales. Oddly on the 17th I am informed I had 7 sales.. Personally I think these were simply logged on the wrong day, why would I have so many sales the day before the sale starts? So I believe them to be free sales. Saturday started and as you 91 versions were 'bought'. 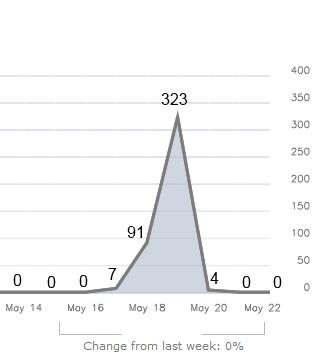 Sunday and now it really hots up and a whopping 323 sales happen. Monday I get a recorded 4 sales. Now I can tell you that 1 of those sales was for the second book app 'ADATZ'. The other 3 could possibly be real sales, or they could be misassigned free versions. No way for me to tell at this time. Now I went into this free weekend with several expectations, or hopes. I wanted to get at east 100 downloads from the free weekend. As you can see I trounced that amount, YAY! I hoped for a bunch of cross over sales. Maybe as much as 10%, so if 100 people downloaded 5GC for free, maybe I could sell 10 ADATZ... Well that has not happened at all. I appear to have a single bought version of ADATZ at this time. I hoped that there would be some form of tail, dragging fro the weekend that might be people buying the game as it is recommended to them from friends who downloaded the free version. As you can tell, I do not see that happening, though in all fairness, I should probably wait at least a week for people to see each other. After this interesting weekend I am going to try an upcoming weekend with my second Book App, ADATZ, but instead of being free, I am going to discount the price. It will be very interesting to see the difference in the downloads etc. It is amazing how much work or time can go into what appear to be the simplest things. Take the background starfield for the Space Invaliens game. Should be easy right? A few textures scrolling over each other at different speeds should look great. Only it appears that certain speeds do not look so hot. Also if the parallax layers are not matched up sin some way they also look odd. I now have controls built into my app so I can live change the speed of the layers and the ratio of speed differences between them. So instead of simply writing the starfield and it looking good in 10 minutes. I have written code to allow me to live change values. Which is a whole lot more work. the really annoying thing is.. I am still not sure what speed to go with, slow and steady graphically looks great, but fast and furious enhances the frenetic or dangerous feel to the game. Of course I may just alter the speed of the stars dynamically while you play the level. Though I have not yet tried this as I am not sure what criteria I should use to determine if it should be going fast or slow. Is it due to your health level? Nah! Is it maybe due to the health level of the aliens on screen? Hmm, not sure how best to evaluate that. Faster the more healthy they are? Nah! I will try to get a video of this on my iPad at some point soon along with the myriad other things I have changed, as frapsing it on my PC isn't working well enough speed wise at the moment. My last comment here is that I now have some information on my Book Apps free weekend download and what the numbers are. So will be posting that up most likely tomorrow when I have today's sales information. Every game needs a Font for it too look good, consistent and stand out. Hopefully the Title of your game can match the font in some way and make the screen look like a whole nicely coherent and designed layout. I have been guilty in my XNA XBLIG games of using several fonts per screen. Something at least one of my Peers pointed out to me. Not in an insulting way, but notifying me that he found it pretty horrific I could mix 3 fonts on a page. the thing is I mostly liked what I created.. and yes, as you well know I am no artist (yet I do hold qualifications in art believe it or not!). I liked what I created cos it stood out, in a way that magazines can separate parts of their page by using different types and such, only on a single computer game screen this is simply not acceptable. 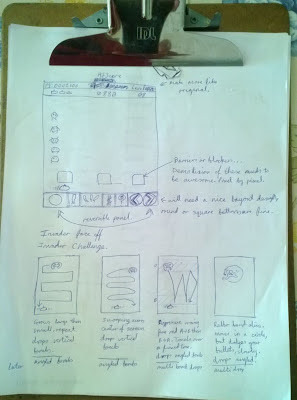 If I had been more talented with layout, I believe my screens would have worked really well, instead that got the point Mostly across, but for sure it is no way perfect. So here I am fooling around with my current game Space Invaliens, cos I am brain dead. The events of the last few weeks have left my mind unable to code. When I try the projected code I want to write seems to fade away from my brain and leaves me vacuous. So instead of coding I am fiddling with various aspects that I am able to do. In this case working with the font. I think it HIGH time that Ariel was removed from the game. Also working on this reminds me how to get fonts into Marmalade, which I need for a font replacement in Hoop Fighter. So I went to one of the places I love to search for such things. www.dafonts.com . A site that has so many fonts it would take weeks to look through them all. However because of the sheer number of them, it is also so difficult to find what you want. That is the second reason I like this web site. Their search options are great. I find some fonts I like but they are all for personal use.. gah! So then I realize I can search by completely free fonts. as a category. After this I make great headway and end up with several fonts I like. Then I whittle them down to two styles (I am learning, now 2 fonts per game :), but I have four fonts. 2 match each type I want. One interesting thing here is one of the fonts is called Chintzy.. and I found out from my daughter who could tell, that this font was used in my Xblig game A Shooter. Wow. cool font! Or I am stuck in the same old place haha. Still I got my font and have put it into the game, in bright neon green of course. Good luck in finding the font for your game. I have no other advice here as I do not have a clue how to find the 'right' font for a game. That is a job for an artist. I could work on the shop. After all we are already collecting the gems needed to buy stuff from the in game shop. In the shop there is also the special section for upgrading special stuff using the salvage that is collecting when fighting enemies. So doing the shop would give me a fair bit of work to do, and allow me to test the powered up ship. I have keyboard controls in already, along with touch screen direct controls. So a player on the iPad can touch the left, right, weapon select or fire buttons at the bottom of the screen. I do have several options I want to create for the controls though, some are new and some are variations or setups. Setting up alternative key mappings is pretty easy, but I may want to allow the player to select any key for any task, so that's a bit of work. Up next is mouse control. this requires me to follow the mouse and use the two buttons on it for weapon selection and fire. Finally, at least for now I am going to introduce a special control mode for tablets. This will include a simple control mode which means you will only have to use one finger to easily control the ship. More details on that when I get it done. In some of my previous titles on the tablets I have been good about being resolution independent. Only for some reason for this I decided not too, well actually for Hoop fighter, which is the code base I am using for this game. It was a silly mistake, taking out something that was already fully functional, and now I want it back so I can produce this game for any device. gah! What an idiot. Still, it won't be a huge job to get all that back in and working. Then I can once again test on iPhone and iPods and Android devices. As you can see from the videos I have done so far. I do not have real graphics for this game. I am stealing them from all over the place. I am fortunate to have some great graphics to steal from, still, one of my desires is to find the right artist to create art for this game. I also am thinking about kickstarter, yet I believe my chances of success at that are slim, with no graphics.. Project Greenlight is something else to look into, as I really would like to release this for PC, and probably Mac as well, though mouse mode might be odd with only a single button mouse haha. Should I be drumming up support on Twitter and Facebook, and trying to connect with reviewers already for this title.... Hard to say, but I do believe it cannot be too early. Setup more information on my web pages, to include this.. gah!? SI Diamond Gameplay from Robert Toone on Vimeo. Above is my latest gameplay video showing my second Alien I call SI_Diamond. It is in fact the diamond shaped movement routine from my 'Space Invaliens' game. This nasty alien spawns all those little sawblades that once spawned wait a small moment to target you, then they fly right at your established position. As they come streaming in it has the effect of cornering you, unless you know how to play them. Most dangerous when there are separate groups all after you. With its fast awkward movement and the spawned sawblades, it can be a handful. In fact two of these together makes for an interesting time. Space Invaliens SI_ONE in Action from Robert Toone on Vimeo. In the video above you can see my SI_One alien. That is his working name and it is simple Space Invaliens first enemy. This is also one of my main Homage styled aliens. He speaks the Dum, Dum movement sounds, and at his demise you can hear him yell. I don't at this time have video of his other sayings. There is a lot going on in this short video, and I do apologize for the way the video is formatted, Thanks to the new and way more useless windows movie maker, it reformatted it (I need to chop off the start and end bits). I guess I will have to get some video editing software on this laptop now, gah! SI_One, moves like a space invader for the most part, though he never 'lands'. He sounds similar to space invaders, and I am very happy with the test results on the dum, dum audio. Interestingly it has 4 levels in the arcade game, and here I was only thinking 2. Then it drops bombs all over the place. By itself SI_One is not particularly dangerous, but mix him with another alien, or add another of his kind to the screen and the levels get a Lot more exciting. By creating my aliens in this way I am able to mix and match alien play styles to come up with compelling and difficulty blended levels. You may also notice me disregarding the yellow gems that are the money for the game, and the parachuted salvage that you really want to collect if playing properly. Tomorrow I will show another aliens, one I call SI_Diamond. I am continuing work on 'Space Invaliens' at a good clip. Yesterday I got to record some audio for the game, so my vertical slice has sounds. the sounds are important for this game as I really want the enemies to have character, and one way for me to do that is to add voices for them. I also bought the Space Invaliens .com web site in preparation and setup a simple it of redirect information. Still it's a start, now back to words in games. As it turns out playing the game also brought fear and anticipation to our time playing the game of Sinistar. It was not the best shootemup around, but the atmosphere it created was simply stunning. Hard to create that same sense now of course, but it will not stop me trying. I will get a video soon, once I redo the playback rates of the audio. so far the SI_One alien sounds like a mouse as my playback rate is way too fast. Posted by VoodooChief at 9:38 AM 0 comments " I HUNGER!! " Here is a video taken a few days ago of Space Invaliens(new working title, or Publishing title.. hmm?!). Check out the video and I will describe some aspects of it below. Yellow Gem Spawning from Robert Toone on Vimeo. This video was taken to show the spawning of the Yellow Gems. It seems like such a simply thing to spawn collectible items like these gems when the enemy ship is hit. But there are a lot of design considerations involved. I will go through just a few of them here. How: Well once your bullet hits the enemy ship it will spawn a gem for you to collect. These have to float down the screen so they can be run into by your ship to collect them. Problem: You can fire very quickly. So you can hit the enemy ship with 4 bullets so quickly that if I simply spawn all of these gems by placing them and letting them fall down the screen, they overlay each other. You cannot tell how many gems there are, which is a waste. Do what: My solution to this problem was done in several ways. The reason for that is if I tried to solve this with just one method, it would be invasive, noticeable, and to be honest I didn't like it much. I decided to spawn the gems with a slight offset from the contact position. Then I also gave them a slightly different base speed plus a random amount to float down the screen, I also added in a slight drift. This allows the spawned gems to drift apart while coming down the screen. Now you can see them come down the screen, and can count them. Which is what I was aiming for. Once they are close to you ship you have like a magnetic or tractor beam effect on them, which draws them into your ship. This looks pretty good, or did once I added a shrink to it as they are drawn in. Finally: You can see my deflector shield on the ship, though with me not hitting anything, there is not much to see, but IT does work very well, and works perfectly as per my design. I do not tend to write whole articles about someone elses blog, Usually I simply mention them here and there and supply links. In this case though I feel I should do a bit more, as it is incredibly relevant to my current development. It is a truly great read that is well laid out and slightly worrying. Though if I can get 6000 hours of my game played, maybe I will be happy enough. So what's the Worry all about? The article is about using IAP and within an Arcade style game to earn money. they also mention free to play vs paid app. As it happens I am working on an Arcade style game that has IAP in it, and I was thinking of going Free to play.. though now I am not so sure. The final similarity is the fact that they added Advertising in, though late. whereas I will be adding that in much earlier (I learned that lesson already with 'Hot Chicks'. With all these similarities I am a bit worried that I will not be able to make back the budget I have for artwork. This is disconcerting, as making money is a dream for these games, however donating money so people can play my game is not something I want to do. I would love to at least break even for each title I release. So what's the plan? This article has pointed me in the direction of a Paid App, and then doing Free to grab weekends to boost user awareness and downloads. As I will be going with Ads in the game anyway, it looks like I might be able to make some money their. Though I am not certain what Targeted Ads are over normal Ads. I have my Ads setup in a non invasive way and they are also click through (I have a page that appears every so often between levels). Of course my Ads are removed for people who have paid for the game.. though right now I am wondering if I should do that, or simply reduce the amount that are shown. The Ads were added when I was thinking of going Free to Play. Hmm, well I am a long way off publishing this game, but I am worried about how much money I will allow myself to spend on the artwork for it. I was working, or thinking about the players shield. I really want something to help with those really troublesome times when a player gets backed into a corner, yet I really did not want to do the usual thing of simply adding to the amount of health a player has. So I have the answer, it is what I am calling a deflector shield. The deflector shield simply deflects single enemy bullets, rather than absorb them. It will also refresh given some amount of time to recharge itself. This will solve all the problems I have and want a shield for, and yet it seems not give me any new issues. Let em list a few of the reasons off the top of my head. Don't want an extended health bar. No HUD graphics required. The image of the shield around the ship should be enough. Don't want simply more health. With this being a single time hit and it pops type of deal, it is anything but more health. also it will not care how big or dangerous an enemy bullet is, they are deflected the same. Great for enhancement. Instead of simply added more 'health' to the shield. This type will allow me to add more hits before it pops. More enhancement can be achieved by shortening the recharge timer. With the recharge it is a very powerful device, but is more for getting out of tight spots than charging through enemy firepower willy nilly. Use when in danger. They are a few of my reasons. I would have a graphic here except I forgot to take a picture. DOH! Here is the 2nd video of the Invaders game. It is amazing what I can program while sat in the waiting room of a Hospital. Also while waiting for blood to be drawn, or even while waiting for the Dr at the Doctors office. I have reused a number of systems that I either reused for the Hoopfighter game, or created while programming it. So when you look at the video, check out the reused systems. Collectables control allows me to easily and quickly create the bullets and the Alien itself. Invaders 2nd movie from Robert Toone on Vimeo. I did have to create a new collision routine so the Collectables could collide with other types of Collectables. Apart from that I have not created anything new for this game, routine wise of course. I can tell you are watching the video and thinking. WHAT THE HECK is that Alien thing moving down the screen. Instead of looking at the aliens drawing, how about looking at its movement, which I modelled on the Space Invaders wave movement. I also did several things in this prototype thats harder to notice. It is those little details that I believe sets my games apart from some of my competition. This alien drops bombs, not just from its center, but also from the its edges. This made a much more exciting spread of bombs to dodge. It also allowed me to not corner the player too easily. This alien does not fire when it does its last two strafing runs across the screen. I believe that would be unfair to the player, and not what I really want to do to a player. It is about the player enjoying the fight, not being punished because the bad guy got too close. The Health bar although in a test reduction configuration. You can see that I have chosen to not simply take the bar and reduce it from the right side to the left. Instead I have centered the health bar in the screen, and then I have made the bar shrink as health is reduced. Yeah, so I also colored it for more pizzaz, but really this type of health bar has a real benefit over the long line slowly shrinking to the left. The main advantage is that it is always easy to see how much health you have, also health that disappears goes from both sides and this makes you notice it so much faster.. and makes a player more worried. I also believe it being centered in this way makes it really obvious when you are really low on health. I have more to write even about this video, but it will have to wait. I'll try to mention them in my next installment.